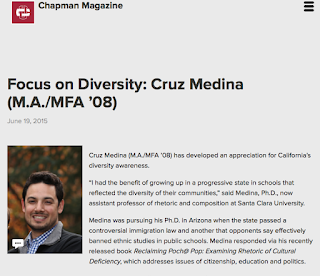 A couple months back, I was interviewed by Chapman Magazine about my book Reclaiming Poch@ Pop. I earned my MFA in creative writing and MA in English at Chapman University in Orange, California (deep behind the 'orange curtain'), and where I came to appreciate fellow pocho Chapman-grad Gustavo Arellano for his insightful barbs in the OC Weekly. It was great to be recognized by an institution where I'm an alumnus. I tried to shout out as many of the professors at Chapman who influenced my research trajectory, but there's never enough space to mention everyone. I don't think Mark Axelrod made it in there even though he was the first to give me a shot as a TA in his upper-division grad course. His course on Borges and Cortazar also was the inspiration for my travels to Buenos Aires. Brian Glaser intellectually challenged and demonstrated saintly patience. And no one can discount James Blaylock's contribution to the writing program there at Chapman, where he's an inspiration as a prolific writer and steadfast educator.